TRIVIA of Noh : Q107 :Do the costumes vary with the pieces being performed? | Home | Trivia | Q107 : Do the costumes vary with the pieces being performed? Do the costumes vary with the pieces being performed? How do musicians and singers choose their costumes for performances? Mainly, the selection is based on how the pieces they perform are treated. Noh pieces are classified into “heaviness” levels by the head families. The levels are almost the same, even if some minor differences exist among the schools. In the case of the costumes, there are three types, montsuki (a crested kimono), han-gamishimo (ceremonial dress with short trousers), and naga-kamishimo (ceremonial dress with long trousers). 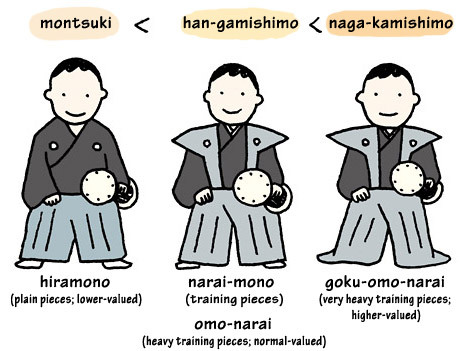 These are basically chosen for pieces called hiramono (literally, plain pieces; lower-valued), naraimono (literally, training pieces) or omo-narai (literally, heavy training pieces; normal-valued), and goku-omo-narai (literally, very heavy training pieces; higher-valued) respectively. Okina and the pieces that accompany it are given a special treatment, and suō (ceremonial dress of lower-class samurai) is commonly used. If a lower-valued piece has a subtitle in its name, it may be raised to a higher grade and require costumes for the higher level. "Kiyotsune: Koi-no Netori" (by The Kanze School) is one example. If a performance is a special event, such as a memorial performance to mark the death of a great performer, the piece is also raised to a higher level. Among the people on stage, musicians and singers are supposed to be "visible" to the audience, and there is a basic uniformity in their costumes. This means there is never one wearing montsuki while another is in kamishimo. Assistants of the singers, however, are supposed to be "invisible" to the audience and wear costumes of a lower level.